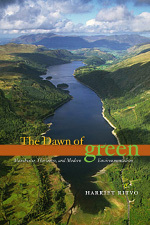 The Dawn of Green: Manchester, Thirlmere, and Modern Environmentalism. Located in the heart of England's Lake District, the placid waters of Thirlmere seem to be the embodiment of pastoral beauty. But under their calm surface lurks the legacy of a nineteenth-century conflict that pitted industrial progress against natural conservation�and helped launch the environmental movement as we know it. Purchased by the city of Manchester in the 1870s, Thirlmere was dammed and converted into a reservoir, its water piped one hundred miles south to the burgeoning industrial city and its workforce. This feat of civil engineering�and of natural resource diversion�inspired one of the first environmental struggles of modern times.